This book features fifty-two inspiring stories, from NFL stars to bestselling authors, whose lives have been changed by Centrella’s 8-step technique to success and fulfillment. When Sarah Centrella kicked her cheating husband out, she didn’t have five dollars to her name. Her electric, water and gas bills were all past due and rent was late. She hadn’t worked in over two years. The car title was in her husband’s name, as was their bank account. She was destitute and stranded with no way to provide for her three small children. Instead of falling apart, Sarah took charge of her future. In just eighteen months Sarah went from a newly single mom living on food stamps, to an executive of a software company. Her book, Hustle Believe Receive proves that anyone, no matter where they start from, can change their life, achieve success, and live their dream. Sarah’s story has impacted hundreds of thousands worldwide. Her blog, Thoughts. Stories. Life., has garnered international recognition and popularity, inspiring hundreds of thousands worldwide with her simple eight-step plan for achieving success known as the #HBRMethod. The book features fifty-two inspiring stories of people who believe in Sarah’s message, each of whom she personally interviewed for this book. They include: NFL star running back Jonathan Stewart; NBA power forward Anthony Tolliver; famed artist Victor Matthews; bestselling author Laura Munson; middleweight world boxing champion Daniel Jacobs; CEO Ryan Blair; and Morgan Stanley executive vice president Kimberley Hatchett, among many others. 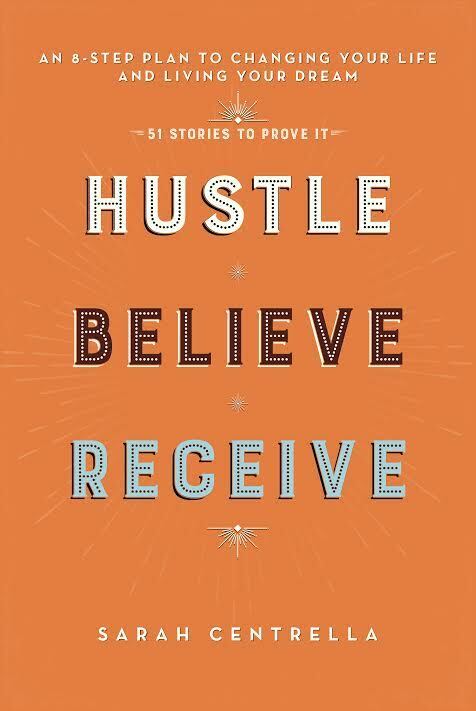 Hustle Believe Receive shows how these stories are connected, and how Sarah, a single mom from Oregon, manages to bring them all together in the most unlikely way. This book and Sarah’s method are changing people’s lives. Sarah Centrella is the author of the blog Thoughts.Stories.Life., a chronicle of her personal journey as she went from “nothin’ to somethin’.”Hundreds of thousands of people around the world read her blog, many seekingadvice on how to follow her example and apply the #HBRMethod to achieve success. Her story has been featured on The Steve Harvey Show, in the New York Times, on CBS’s The Talk, in an American Red Cross national PSA, on CBS Radio, on NBC, and in the book Adventures in Manifesting. She resides with her children in Portland, Oregon.